Note: I have extensively revised the posts on this house. I thought at first circle geometry had been used even though it didn't quite fit. Then I tried using the 3/4/5 proportions of a right triangle. Those proportions do work. The new post can be found here: http://www.jgrarchitect.com/2014/10/the-cobblers-house-c-1840.html . 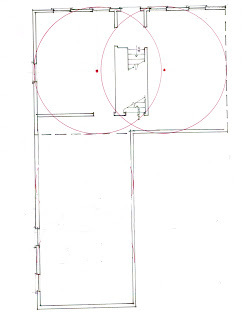 I have left this post because of its introduction to the house and the floor plan with circles. Here is the farm house, a story and a half cape, the contemporary shape for 1840, but in the old fashioned pattern: center entrance, 2 windows on each side. Its first owner is listed as a cobbler. There is a spot to the side of the house where a very small work shop probably stood. He may have made shoes for the community or done piece work for a jobber who took the work to a factory in a near by town. Often men worked in the shop while women did similar work in the house. In 1837, the market for wool which had made fortunes for New England farmers,- including the farms in this neighborhood - disappeared. Australia could produce wool cheaper. A 'Panic' ensued - today we would call it a depression. So the owner of this house was cautious and frugal. The house is small. Its windows are tiny with 27" x 22' sash - the part that goes up and down - in an era when most sash were about 30" x 30". In my last post I wondered if my measurements were off. So I checked, redrew very carefully, and then laid out the circle geometry: 2 circles with the same radius, each circumference running though the center of the other. My last post includes a diagram of this. It is off, just barely. If the house were 4" smaller the circles would overlap as they should on their centers. I am still working on your edits to Africa House, thanks. I did take the time to read this post this morning, and loved it. Have you ever applied the 3-4-5 triangle to some of these traditional homes? 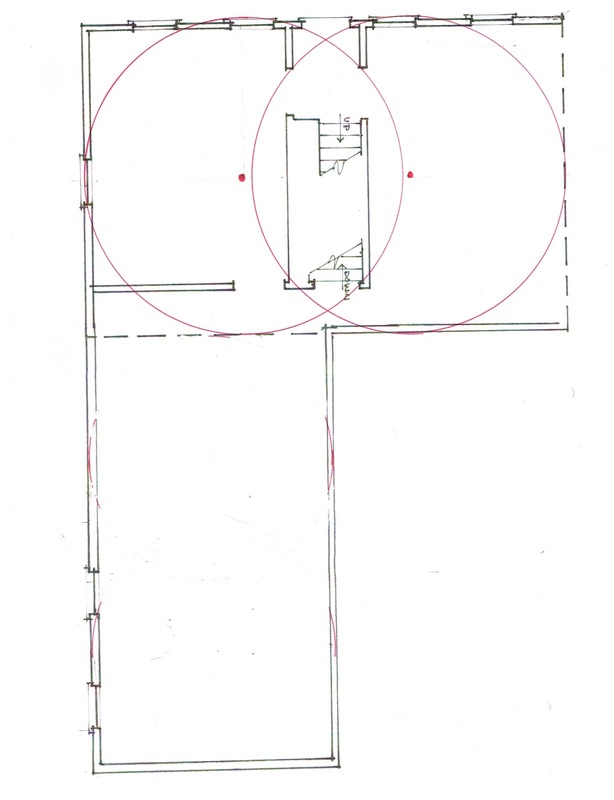 I know in Barns it shows up often, and is also part of the "golden section," geometry. I haven't use the 3-4-5 triangle alone. I will try it. My blog is now being translated by Google for readers in China, Bulgaria, Pakistan, Western Europe - so I try to make the pictures clear and simple, in case the translations aren't quite right!